French Drains have become synonymous with the interception and/or control of sub surface water. However their installation is not always beneficial when they are used as a remedial measure to control damp problems in existing buildings. Originally designed (some considerable time ago) and then improved and named by an American farmer more recently (19thC), the French Drain is effectively an evolved land or field drain. Originally early farmers would have cut shallow interceptor trenches across fields as dewatering measures. The trenches would have been filled with stone to keep them open. This system is still used today – although farmers now generally build deeper trenches with perforated pipes laid in the bottom. The idea of creating a more (efficient) open channel in the bottom of the trench – originally using clay tile – was supposedly Henry French’s (although one might suspect others had used it before him). The main thing to bear in mind is the land or field drain is a means of control for surface water or de watering water logged soil – on clay. Well drained soils do not generally suffer from water logging – for obvious reasons. I first came across French Drains when working as an engineer on road construction. For this application, they are used for the interception and disposal of high volumes of surface water collected from the road surface. Generally any unsuitable material exposed in the construction strip was replaced with a free draining material – so the French Drain had very little to do with interception of sub surface water. It was simply a deep trench filled with stone (and a perforated pipe) necessary to intercept and discharge high volumes of surface water. With a few exceptions (well drained soil lying over a tilted bed of clay or ground sloping dramatically towards a building for example) – water doesn’t generally move laterally sub surface. If the soil is clayey water doesn’t move through it but over it. If the soil is well drained, water percolates straight down to the water table. This brings us back round (once again) to the old chestnut ‘Rising Damp’. When a damp problem is identified in an existing building, French Drains are often installed (sometimes even as a preemptive measure), – which often exacerbates the situation – creating a deep stone filled muddy puddle around the building. More often than not damp problems are caused by ineffective management/control of surface water over badly draining (clayey) soils. The fix – to re profile the external ground and install surface/open channels or interceptor drainage – can be invasive and costly – with installation of a French Drain usually being much cheaper. 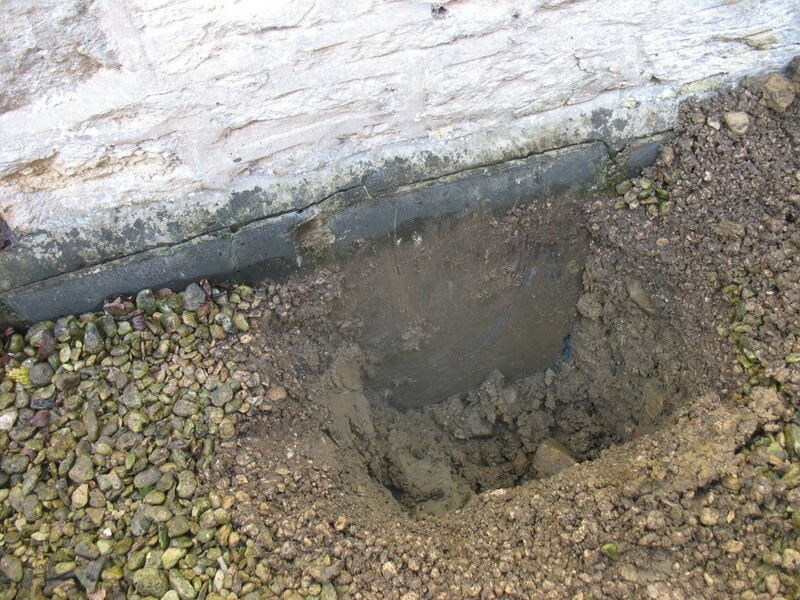 It could be argued that a French Drain can still act as an interceptor drain – so what is the problem? However there are a number of logistical problems with constructing a French Drain around a house – as opposed to laying one across a field. As a field drain it will be taking high volumes of surface water and will often have falls to open ditches. As a small drain excavated around a building, sufficient falls will be difficult to achieve and water flow will usually be minimal. Water will generally trickle into the trench, bypass any perforated pipe and sit in the bottom of the trench – keeping the soil saturated. It is advisable to keep any surface water where you can see it – rather than allow it to travel sub surface. This is not to say there are no applications for French Drains with regard to construction. They are effective interceptors for buildings which back onto sloping ground. They can also be used to drain back-filled material around new build subterranean structures – or be used to de water chronically saturated ground. However in the case of a thatched cottage with damp problems (for example), it is always preferable to focus on shedding water clear of a building perimeter to open channels – rather than digging a French Drain around it. Given time the French Drain often morphs into a planter which, although more aesthetically pleasing, compounds any problem there may previously have been.